Welcome to VerbalEnergy.com, home of The Articulate Professional. Since high-achievers recognize the immense value that lies in constantly invigorating their communication skills, this site offers several features that will undoubtedly attract your interest! Among them: "Uncommon Tips for Highly Effective Presentations;" "Uncommon Tips on Public Speaking;" topics on communication training/coaching designed to help you master the techniques used by enormously successful communicators such as Gen. Michael Hayden, David Darst, David Frum, Rep. Adam Schiff, Ellen Futter, Susan Desmond-Hellmann, Marin Alsop, Condoleezza Rice, David Axelrod, Neil deGrasse Tyson, David Brancaccio, and anti-terrorism expert Bruce Hoffman. 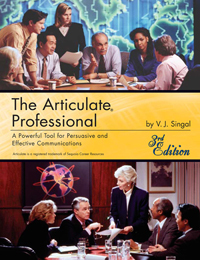 It also includes a list of our clients and testimonials; tips on how to enlarge your vocabulary as well as tips on how to use it without coming across as intimidating, pretentious, or pompous; information about our widely acclaimed publication The Articulate Professional (3rd Edition, 2008); some coaching success stories; and of course, our popular feature "Words of the Month" which, until June '09 when AvantGo changed its business model, was that Sybase company's most popular educational channel and boasted a subscription exceeding 176,000 high-achievers. Quick quiz: Which word did Glenn Close have in mind when she misspoke at the Golden Globes?